The FloWare module Synchronize Testprep can help in OrCAD PCB Editor or Allegro PCB Editor to assign a test point when using dummy test symbols (1-pin part with RefDes TP*) in the schematic. This app will generate from the schematic an corresponding test point in the PCB layout data base. 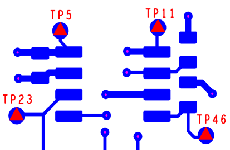 Afterwards all PCB Editor post processing routines for test points (Testprep) can be used as usual.